The first ever English translations of the Alexander Solzhenitsyn’s autobiography, ‘The Little Grain,’ and the remaining volumes of his opus, ‘The Red Wheel,’ will be published by next year in the US. When Alexander Solzhenitsyn was expelled from the Soviet Union in 1974, he was welcomed with open arms by the West. But the dissident, who had won the Nobel Prize in 1970 for his work ‘The Gulag Archipelago,’ did not woo the Western public. During his 20 years of exile, Solzhenitsyn dedicated almost all his thoughts and writing to Russia – the country he had fought for and that had imprisoned him – and he remained an unaffiliated political agitator, willing to criticize the culture that had taken him in, as well as the one he had left. Ultimately, this lauded survivor of the Gulag and advocate for human rights became known as a fringe nationalist with ultra-orthodox views, gaining the reputation as a reclusive and unproductive writer whose best days were behind him. Both of these views do not do full justice to a complex figure whose legacy in the West has been hampered by the lack of English translations of his work from this time. One popular impression of Solzhenitsyn’s exile in the U.S is that it was unproductive. The writer is seen to have distanced himself from his immediate environment, and it is often assumed that he was simply not interested in assimilating into the culture. His son, Ignat Solzhenitsyn, refutes these claims. In an interview with Daniel Kalder (The Times, Jan. 5, 2010), Ignat explains that the need to write ‘The Red Wheel’ – Solzhenitsyn’s magnum opus – was what kept him from engaging more with his American surroundings. The younger Solzhenitsyns’ recollections of their American childhoods reveal a father who sent his sons to local schools, encouraged them to learn English, let them listen to music he detested – like Black Sabbath – and generally allowed them the freedom to assimilate with their peers. However, the majority of what Solzhenitsyn wrote in the U.S has not yet been published in English, including his account of his time in America, ‘The Little Grain Managed to Land Between Two Millstones.’ This has limited English-speaking critics’ full understanding of his ideas and perpetuated the commonly held belief that his time in exile was unproductive. This is set to change thanks to the recent creation of the Solzhenitsyn Initiative by the Wilson Center’s Kennan Institute. Funded primarily by donor Drew Guff, managing director of Siguler Guff, the initiative is an attempt to help illuminate the writer’s legacy. It will produce the first ever English translations of the author’s autobiography, ‘The Little Grain,’ and the remaining volumes of his opus, ‘The Red Wheel.’ According to Joseph Dresen of the Kennan Institute, the first translations will be completed in late 2015. 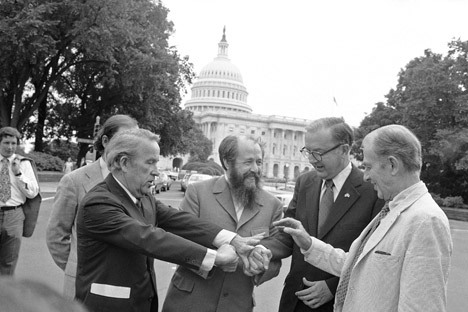 For much of the late 1970s and 1980s, Solzhenitsyn was portrayed in the Western media as a cranky has-been. In Kalder’s interview with Ignat Solzhenitsyn – now an acclaimed pianist and conductor – Kalder asks him how the view of his father as an embittered prophet gained such prominence. Solzhenitsyn’s 1978 Harvard University commencement address is the perfect example of the disconnect between his uncompromising attitude and the expectations of his audience. In keeping with his dissident roots, the author spoke vehemently – through a translator – against what he saw as the shortcomings of the Western world. As unpalatable as this speech may have been to a Western audience, it is consistent with Solzhenitsyn’s character. He was an author who didn’t mince his words and wasn’t afraid to criticize the Soviet regime at the peak of its power. Although the West had offered him refuge, that didn’t mean he automatically aligned himself with Western ideology. He was a stateless political agitator capable of making astute observations about the failings or successes of any culture as he saw them. Mahoney, who has recently published the book ‘The Other Solzhenitsyn: Telling the Truth About a Misunderstood Author and Thinker,’ writes that ‘Solzhenitsyn’s moral vision has too often been politicized in ways that mistake his rejection of progressivist illusions for a reactionary refusal to admit the possibility of progress.’ Yet Solzhenitsyn’s steadfast belief that he would return to Russia was the essence of admitting the possibility of progress. Solzhenitsyn’s legacy is undoubtedly still relevant today, as shown by the fact that ‘The Gulag Archipelago’ is required reading in Russian high schools. Now, with English translations of his remaining works finally in the pipeline, Western readers will be able to evaluate this challenging writer’s complete output firsthand, and may reassess their view of his time in exile as a result.